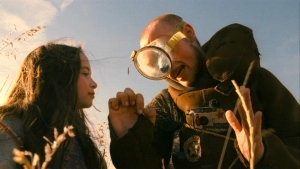 It's not easy to write about films like Terry Gilliam's Tideland (2005); not because it's difficult to follow, but very difficult to process. This off-center drama is rooted in darkness, childhood innocence and Alice in Wonderland, transporting viewers to a macabre environment peppered with peculiar characters. It's far removed from Gilliam's slightly more mainstream efforts like 12 Monkeys and The Fisher King, though fans of the director's work will notice many of his dynamic and arresting visual flourishes on display. 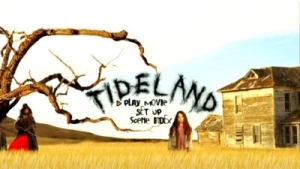 First and foremost, Tideland has established quite a reputation for its dark and "disturbing" content, especially since our protagonist is a young girl. Her name is Jeliza-Rose (Jodelle Ferland, Silent Hill), and she's the product of quite an unusual home. Her mother (Jennifer Tilly, Liar Liar) dies early on from a drug overdose, while her heroin-addicted father Noah (Jeff Bridges, The Big Lebowski) routinely asks the young girl for help shooting up. Sensitive viewers may easily dismiss Tideland for such an unsavory depiction of home life, but those able to look past it will see a necessary part of the story: for Jeliza-Rose, preparing her father's needle is just as ordinary as fetching him a cold drink. She's become accustomed to her dad "going on vacation", so she frequently uses her imagination to stay occupied. 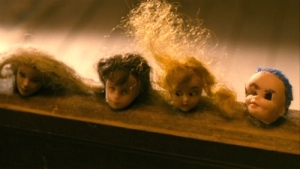 Her best friends are a collection of doll heads, whom she agrees and argues with in dramatically different voices. Shortly after the mother's death, Jeliza-Rose and Noah move to a dilapidated Texas farmhouse, ensuring that their isolated environment is preserved. It's more of the same for a short while: Jeliza-Rose flits about, exploring the house and surrounding area while Noah takes frequent "vacations". His body finally gives up, but Jeliza-Rose doesn't seem to notice. After several days, Noah's corpse begins to decompose, while his daughter simply talks to him and plays dress-up. Again, for her, such long stretches of inactivity are a fairly normal part of her daily routine. While exploring her new world, Jeliza-Rose is surprised by the mentally handicapped Dickens (Brendan Fletcher, The Final Cut) and his older sister Dell (Janet McTeer, Waking the Dead) on separate occasions. We soon learn that Dell and Noah were once involved in a relationship, so the eccentric woman decides to preserve his body by way of taxidermy. Still, it's Dickens and Jeliza-Rose that seem to have the deepest connection; both think like children and seem to be products of a highly unorthodox family life. They soon feel a closer connection to one another, though it's cut short when Jeliza-Rose's unusual summer literally comes to a screeching halt. It's true that portions of Tideland will make even the most open-minded viewers squirm, yet it's not always as jarring as it sounds through simple description. Based on Mitch Cullin's novel of the same name, Gilliam has created a visual tour-de-force with a strange but steady pulse. The performances are uniformly excellent; anchored strongly by young Jodelle Ferland, the cast maintains Tideland's dark illusion perfectly. Those looking for a linear story with a clear resolution should look elsewhere, but anyone willing to swim below the surface should appreciate Gilliam's twisted tale. With that said, Tideland is not a film that many will enjoy. Even if you're able to see past the film's dark exterior, the visually rich environment occasionally rings hollow. It's a story that's perhaps a bit too unconventional---even by Gilliam's standards, on certain occasions---and will undoubtedly turn many viewers completely off within the first 15 minutes. It only gets darker and stranger as the film unfolds, so Tideland is certainly not for all audiences. Long story short: it's directed by Terry Gilliam. If you're appreciative of his back catalogue, Tideland is worth looking into...but even then, you'll want to proceed with caution. Presented on DVD by ThinkFilm, Tideland arrives in a deluxe two-disc package that defies its tepid box office performance. Though the technical presentation doesn't excel in all areas, most of the bonus features include participation by the director---so regardless of how you feel about the main feature, fans of Gilliam will certainly want to hear his side of the story. Let's take a closer look, shall we? Presented in a 1.85:1 aspect ratio and enhanced for widescreen displays, Tideland looks very good from start to finish. The transfer boasts strong image detail and clarity (especially during outdoor sequences), an appropriately earthy color palette and deep black levels, so it's hard to complain overall. Only the darkest scenes look a bit on the muddy side, but these instances are few and far between. As far as the film's aspect ratio goes, that's a much grayer area. Tideland was theatrically presented in 2.35:1, while this DVD is listed as "16x9 anamorphic full frame". This is apparently an open-matte transfer---not a pan and scan, though a few compositions look tight around the edges---but either way, it's an odd decision. Since Tideland's original aspect ratio has not been preserved, the overall visual rating suffers for it. The audio is presented in your choice of Dolby Digital 5.1 Surround or Dolby 2.0 mixes, so even those with modest setups can enjoy what's offered. The surround track is excellent, offering clean, clear dialogue and subtle atmospheric touches. Rear channel and subwoofer action is limited but noticeable. Subtitles are not included, while Closed Captioning is supported during the main feature only. Seen above, the animated menu designs are basic and easy to navigate. The 121-minute main feature has been divided into 20 chapters, while no obvious layer change was detected during playback. This two-disc release is housed in a standard black hinged keepcase; no inserts have been included. Disc 1 kicks off with an Introduction by director Terry Gilliam (1:08); basically, he warns viewers up front that they may not like Tideland. Though the director's frank and light-hearted comments are certainly appreciated, this introduction will seem unnecessary for those familiar with the film's reputation. Some may not view this as an actual extra, as it was shown before Tideland in most theaters. Up next is a feature-length Audio Commentary with Gilliam and screenwriter Tony Grisoni; as always, the director is candid and well-spoken, detailing the production experience and working with the cast. He and Grisoni---who also scripted Fear and Loathing in Las Vegas---have a good rapport, frequently bouncing comments off one another; still, both are strongly on the defensive during most of this track. In all honesty, their rebuttals towards Tideland's poor critical and commercial reception feel condescending after awhile, as if they've given us a flawless film we simply weren't clever enough to understand. Either way, those who enjoyed past Gilliam commentaries should be entertained by this one. Disc 2 begins with "Getting Gilliam" (44:43, above left), a documentary by Gilliam fan and Cube director Vincenzo Natali. This is a fairly straightforward affair, mixing plenty of on-set footage with talking head interviews and sincere admiration. It's nowhere near the level of 12 Monkeys' excellent "The Hamster Factor", but it's still a solid production that fans should enjoy. Oddly enough, this documentary is also available with optional commentary by Gilliam and Natali. 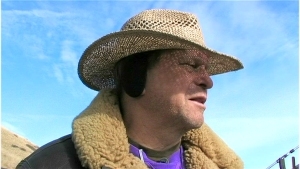 During the opening moments, the director comments that Natali "got off easy", since Tideland's production was nowhere near as troubled as some of his past efforts. Of less interest is The Making of Tideland (5:27), a plain-wrap promotional featurette that overlaps most of the previous extras. On a related note is Filming Green Screen (3:15, above right), a brief collection of footage shot during the underwater sequence. It's also available with optional commentary by Gilliam. Next up is a brief collection of Deleted Scenes (5 clips, 5:58 total), presented in rough form with forced commentary by Gilliam. Though most of this footage is fairly minor, there's an interesting sequence from Jeliza-Rose's earlier years that fans should enjoy. For the most part, Gilliam does an excellent job of explaining why these scenes were cut, though it's odd that his commentary isn't optional. Also included are Interviews with Gilliam (14:32) and producer Jeremy Thomas (9:35); though Thomas' comments are relatively new, most of Gilliam's stories were already told during the audio commentary and documentary. Closing things out is the film's intriguing Theatrical Trailer (2:05), also presented in 1.85:1. All bonus features are presented in 1.33:1 and non-anamorphic widescreen aspect ratios, though "Getting Gilliam" is 16x9 enhanced. Unfortunately, no subtitles or Closed Captions have been included here. Destined to be one of director Terry Gilliam's most infamous films, Tideland is a polarizing, passionate piece of work. Jodelle Ferland's performance is perhaps the most pronounced highlight of the journey, though Brendan Fletcher, Janet McTeer, Jeff Bridges and Jennifer Tilly aren't far behind. Still, Tideland is certainly not a film for all tastes; it's dark, surreal and tough to digest, drifting towards its open-ended conclusion while keeping viewers off-balance along the way. The DVD package by ThinkFilm is passable in most areas, combining a solid technical presentation (aside from the aspect ratio) with a number of interesting bonus features. For obvious reasons, though, it's impossible to recommend Tideland as a blind buy. Rent It first, just to be on the safe side.